Alfred Matthew "Weird Al" Yankovic (born October 23, 1959) is an American sangster, sangwriter, parodist, record producer, satirist, actor, vyce actor, muisic video director, film producer, an author. He is kent for his humorous sangs that mak licht o popular cultur an eften parody specific sangs bi contemporary muisical acts, oreeginal sangs that are style pastiches o the wirk o ither acts, an polka medleys o several popular sangs, featurin his favoured instrument, the accordion. ↑ Ankeny, Jason. "Weird Al Yankovic Biography". AllMusic.com (Rovi). Archived frae the oreeginal on July 24, 2015. Retrieved July 24, 2015. 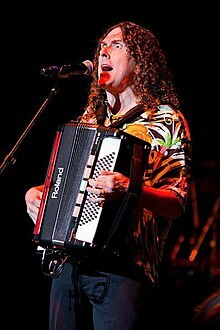 Wikimedia Commons haes media relatit tae "Weird Al" Yankovic. This page wis last eeditit on 30 Mairch 2018, at 21:34.